"I learned about conflict from my parents." So begins Christina McKenna's haunting memoir of her lonely early life. Recounting scenes from her childhood in Ulster, she paints a memorable and poignant picture of violence and oppression with her uncaring father and protective mother, whose retaliation to her husband's penny-pinching came in the form of a secret yellow dress. Buy the book! Christina’s formative years and her foray into the world, which begin with the daily trudge to and from school, are peopled by a troupe of bizarre and unforgettable characters dancing in and out of her life, filling her with awe and wonder. Among them are Miss McKeague, a gentle, calm and graceful religious zealot, Great Aunt Rose, the "Yankees," Norrie the transvestite, and in the wings, her stern, unyielding uncles, each vying for the ancestral money and land to the exclusion of all else. At age eleven, she experiences a frightening paranormal occurrence, a prolonged haunting that confirms for her the reality of the spirit world. Though it affects her deeply, she later learns to channel her confusion into twin artistic passions: poetry and painting. The discordant nature of Christina McKenna's young life, and the feelings of inferiority it bred, lead her to examine all the limiting belief systems she grew up with, and question the validity of the hidebound Catholicism of her childhood. This is a rite-of-passage account of two generations of Irish women, told with great humor and compassion. On the one hand is the writer; on the other the heroic mother who showed her love as best she could. McKenna concludes that our past, no matter how painful, need not keep us bound—once we choose love over hate. That choice, she suggests, will set us free. Buy the Kindle Edition at Amazon! Christina McKenna is the author of the most reviewed Irish book of all time: The Misremembered Man. She grew up near the village of Draperstown, Northern Ireland. She trained as an artist before becoming a full-time author. 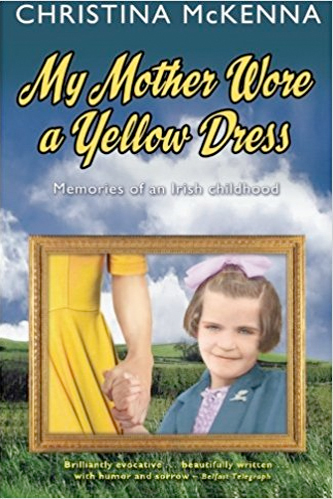 My Mother Wore a Yellow Dress was her first book, published to great critical acclaim in 2004. It was described as a "redemptive postscript to over a decade of Irish childhood memoirs, concluding that our past, no matter how painful, need not keep us bound." She updated and revised it in 2014 and it's now available both as a paperback and a Kindle. The memoir was followed by two nonfiction titles dealing with the paranormal: The Dark Sacrament and Ireland's Haunted Women. Her next project took the form of a novel, in her opinion the most difficult type of writing. The genesis of The Misremembered Man came to her in a particularly lucid dream—evidence that, in some cases, dreams do indeed come true! Her novel was published in the USA in 2008, and is a tragicomedy set in the fictional village of Tailorstown. It's book one in The Tailorstown Trilogy. Book two, The Disenchanted Widow, set largely in the same fictional village of Tailorstown and its immediate locality, was published in 2013. Book three of the trilogy, The Godforsaken Daughter, was published in 2015. It sees a return of several characters from the earlier novels, including Jamie McCloone, the star of The Misremembered Man. Published on October 12, 2017, The Spinster Wife is a departure for her, it being a gripping, psychological mystery. It features many of the places familiar to readers of The Tailorstown Trilogy. A surprise ending will have even the most astute reader guessing.